Journal de La Reyna (World News Today): Last Man Standing Loses Key Actors! Molly Ephraim (left), Kaitlyn Dever (center) and Flynn Morrison (right) are not returning to revived sitcom, Last Man Standing. Tim Allen, Nancy Travis and Amanda Fuller will return. In the wake of Roseanne Barr's remarks, the Fox network puts on a Trump supporting actor who lost his sitcom on ABC due to his controversial off screen antics. They decided to give his sitcom one more season. And it's already controversy brewing. The Tim Allen sitcom already struggling. When Amanda Fuller joined Last Man Standing in the second season, fans loved it. She replaced Alexandra Krosney after the first season of the sitcom. It was the usual quickly recast. It would be the replacement of a character fans never liked. 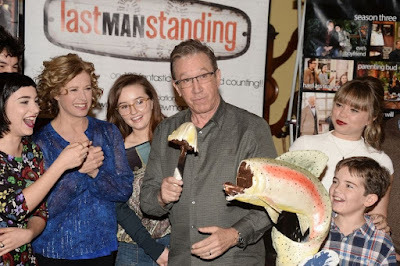 The characters on Last Man Standing were like a true TV family. I am not sure if fans will support the recasting of two characters. Molly Ephraim and Flynn Morrison are not returning to the sitcom. Kaitlyn Dever is signalling a recurring role. After ABC abruptly cancelled the sitcom, Fox decided to pick it up for its next season. It seems six seasons is enough for Dever and Ephraim. Fox signed on Tim Allen, Nancy Travis, Amanda Fuller, Christoph Sanders, Hector Elizondo, Jordan Masterson and Jonathan Adams to reprise their roles. Who will replace Molly Ephraim? She was the breakout star of the sitcom. A memorable episode with Molly Ephraim was her meeting Kim Kardashian West in season one. Also the video where Molly Ephraim, Kaitlyn Dever and Alexandra Krosney singing [My] Pie Rack.